Speaking in front of the entire Middle School and offering a thoughtful reflection are regular occurrences during Wednesday’s Middle School Assembly. What is unique about our assemblies is that the students, not the teachers, are the ones responsible for designing and leading Wednesday’s 30-minute program. As I sat there, marveling at these sixth graders who were timid and unsure a few weeks ago during their first week of Middle School, I could not help but pause, admire, and reflect. Twelve years ago, I was still near the beginning my career in education, teaching at a boarding school in Connecticut just outside of New York. I was teaching sophomore English when my class was stopped shortly after it began, so we could assemble and learn as a school what was happening just south of us. Needless to say, over the next few days I stayed in the dormitory with my students, many of whom had close family working near or at the World Trade Center. Now, twelve years later, I watched as these twelve-year-olds, who entered the world so close to 9/11, promoted resilience and service to others while stepping outside their comfort zones, speaking to an entire auditorium, and showing maturity well beyond their years. I found great hope, both as an educator and an American, watching these young men and women lead an assembly, and I felt such pride in the students and teachers at Walker whose daily interaction can be so simple, so meaningful, and so inspiring. 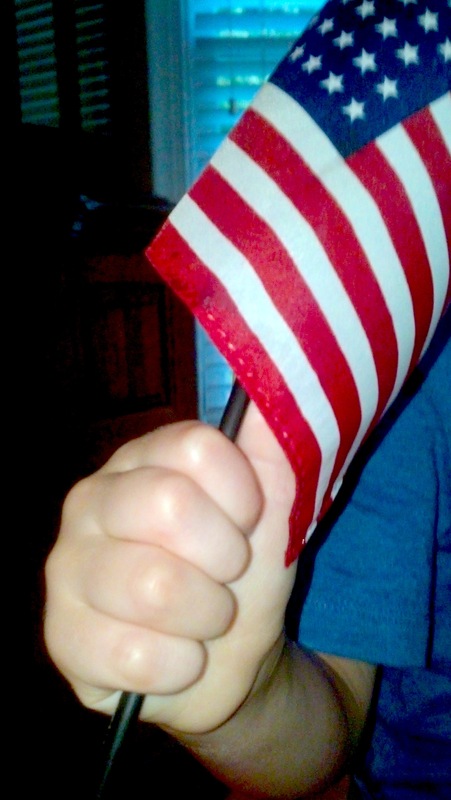 This morning, my youngest child got out of bed, got dressed and rather than eating breakfast opted to parade around our house waving a small American flag. As he stood proudly waving the flag wearing his Superman shirt on this 12th anniversary of September 11, I felt that sinking feeling I get when I remember the tragic events that occurred on this date in 2001. I think back to how sad and worried I was for all of the victims. After the shock subsided, I felt concerned for our nation’s future and the type of world my children would grow up in. Now, 12 years later, I still feel sad about what happened on that day, but I feel more optimistic about our future. And for the reason, I need only to look around me when I am at Walker. Today our students are wearing red, white and blue. It is a patriotic sight as they express their love for America and honor those who lost their lives on September 11, 2001. I am proud of my school and that my daughter is a part of it. We are reminded of our freedom, our soldiers who stand ready to defend us, and those families who lost loved ones in those unthinkable acts of terrorism that occurred on that date. Our students, though most of them were too young to understand in 2001 or perhaps not even born yet, observe this day and appreciate our freedom. I think about three Walker alumni, John Herina, Ross Hermann, and Conner Deebel, who were recently featured in the MDJ for graduating from service academies. They will go on to make a difference and in a huge way, defending and leading our country through their military service. They will make decisions that will impact our safety. Other Walker students have made or will make commitments like them. Knowing that our students will take on these important leadership roles makes me feel positive about our future. I am proud to know that the result of a Walker education is that we send “admirably honest young adults thoroughly prepared for the intellectual and relational challenges of college and life” out into the world. I am also proud to live in a country where a Walker education is possible. The opening few days and weeks of any school year are interesting entities in their own way. There is the excitement of sharing stories of summer activities, the usual grumbling about being the only one who did not get a desired class, and the promise this will be “the best year ever.” All of us start the year with high expectations and the ever present hope of avoiding the usual bumps in the road we call high school. Of our many different assemblies and meetings designed to set the tone for the year, the one I enjoy the most is our student-led Honor Convocation. At this assembly, our Honor Council set the bar high for the Upper School community as different members spoke to the four pillars of our Code: a) “My words will be truthful. My word is my bond.” b) “I will take and use only that which belongs to me.” c) “My work will be my own.” d) “I will not tolerate violations of these principals by others.” Every student speaker acknowledged how as humans we are not perfect and we will make mistakes, and spoke to an ultimate goal of being a community where there is not a need for an Honor Council. In his or her own way, each offered us the challenge to do the right thing when no one is looking and/or when everyone is looking. I have been in many student/parent conferences where the son or daughter has said “I never hear about the good I do, I only hear about the bad.” As one whose glass constantly is “half full,” I believe there is something to be said in sharing the good that is done and the positive expectations rather than using discussions of the bad or the negative to try to inspire the behaviors we want. The good I can share from our first four weeks of classes and the Honor Convocation is that we continue to strive to hold ourselves to a high standard both inside and outside the classroom. What do a medical school and an elementary school have in common? What do a medical school and an elementary school have in common? More than you might initially think. The University of Virginia medical students in the Class of 2014 are undergoing a learning experience that is radically different from that of previous generations. With a new medical education building, upgraded curriculum, and innovative technology, these students are being offered a learning experience like very few in this country. As I reflect on The Walker School’s vision for the future – which includes both building upon an already strong foundation and enhancing our program in many ways – I am confident that our students are embarking on an unparalleled learning experience from the early years in Preschool through their final year in Upper School. Reading the article Adjusting the Prescription: University of Virginia’s School of Medicine Overhauls its Century-Old Educational Approach provided solid confirmation for the new directions in which we are headed. Cooperative Learning: The Medical School’s “Learning Studio” is a radical departure from the lecture halls of the past. The large circular room with tables houses 155 first-year medical students, and Randolph Canterbury, Senior Associate Dean of Education, explains that “one of the goals of this whole model—of having students do a lot of the learning themselves rather than passively listening—is that they need to be lifelong learners.” In many classrooms in the Lower School, you will find desks assembled into tables and often students are working collaboratively on an art project, debating the best medium for a group presentation, or engaging in a cooperative learning task that requires problem solving and creativity. These tables require that students sit “elbow to elbow and knee to knee” in order to do the active learning that Dean Canterbury describes. The Power of Reflection: UVA’s Medical Simulation Center is nationally recognized. While some may think the prestige lies in the six adult and two pediatric medical simulators (one of which costs $250,000), rather it is the Center’s focus on debriefing (or reflection) which is an essential component of the simulation experience. In fourth and fifth grade at Walker, a reflection period is built into the school schedule on Fridays which allow students to seek to understand their role as learners and the power of the learning process. One-on-one conferences during writing and reading blocks in first, second, and third grade, carefully and regularly planned class meetings, and a thoughtful approach to character education which includes student input and leadership provides our students with time to reflect on who they are as learners both in and outside of the classroom. Active Engagement: Students in UVA’s Class of 2014 indicate that this new approach has made them feel less stressed and more engaged than their peers at other institutions. Student Tom Jenkins explains, “The faculty really wants us to understand, not parrot back a lot of rote information…and I like the way everything meshes.” At Walker, teachers place a premium on understanding. Students – whether they are in the hallway working in partnerships, in Winship Library grouped in small clusters with laptops, or in small groups at lab tables in the science lab – are actively engaged in the learning process. They are exposed to countless opportunities for the worlds of art and science (or math and language arts) to collide, just as they do at UVA’s Medical School and in the world outside of The Walker School. Cooperative Learning. The Power of Reflection. Active Engagement. It’s easy to think that elementary education is merely preparation for secondary school or even college. However, I agree with the educational philosophy of John Dewey and believe that education, even at the elementary level, is life itself.